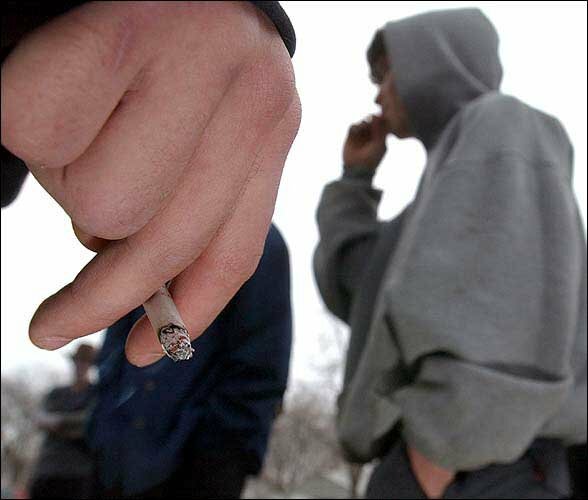 CHICAGO — Smoking among America's youth has reached epidemic proportions, starting them on the path to a lifetime of addiction, the U.S. surgeon general's office said in its first report on youth smoking since 1994. Almost one in five high school-aged teens smokes, down from earlier decades, but the rate of decline has slowed, the report said. Because few high school smokers are able to quit, some 80 percent will continue to smoke as adults, according to the report released on Thursday. "Today, more than 600,000 middle school students and 3 million high school students smoke. We don't want our children to start something now that they won't be able to change later in life," Surgeon General Dr. Regina Benjamin said in the report, which details the scope, health consequences and influences that lead to youth tobacco use. from smoking and encourage all smokers to quit, including passage of smoke-free laws, increases in tobacco excise taxes and fully funded tobacco prevention programs," John Seffrin, chief executive officer of the American Cancer Society and the American Cancer Society Cancer Action Network, said in a statement. Advertising messages that make smoking appealing to young people are widespread, and advertising for tobacco products is prominently displayed in retail stores and online. "Targeted marketing encourages more young people to take up this deadly addiction every day," U.S. Department of Health and Human Services Secretary Kathleen Sebelius said in a statement. "This administration is committed to doing everything we can do to prevent our children from using tobacco." Tobacco companies were quick to defend their practices. Altria Group, parent of companies Philip Morris USA, U.S. Smokeless Tobacco and John Middleton, said it markets to adults who use to tobacco through age-verified direct communications and in retail stores. "The vast majority of our marketing expenditures come in the form of price promotions," the company said in a statement. Altria said its tobacco companies worked to help enact the Family Smoking Prevention and Tobacco Control Act of 2009, noting it was one of the few tobacco companies that did. But U.S. public health officials said more is needed to curb youth smoking. "We can and must continue to do more to accelerate the decline in youth tobacco use," Dr. Howard Koh, assistant secretary for health at HHS said in a statement. "Until we end the tobacco epidemic, more young people will become addicted, more people will die and more families will be devastated by the suffering and loss of loved ones."